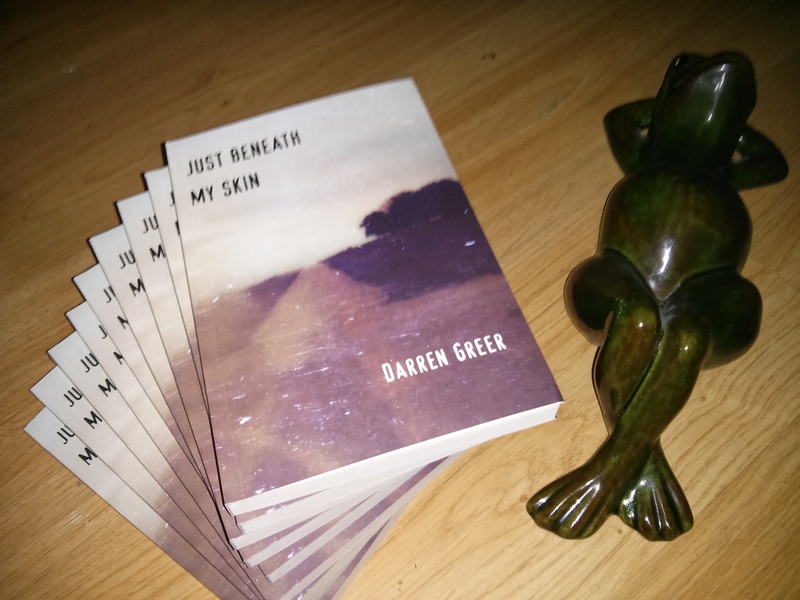 I wasn’t sure how I would feel when I got up yesterday morning and went to the Post Office to pick up the box of author’s copies of my new novel, Just Beneath My Skin. I’m not a patient person; I might have ripped open the the box right in the store to see how they looked, or at least on the bus ride home. I waited. I wasn’t anxious. I wasn’t worried about not liking the design, or the stock, or the dimensions. I just wasn’t sure what emotions would come over me when I held in my hands, for the first time in nearly a decade, a published book I’d written. I’ve gotten over, I think, the kindergarten stage of being a novelist: I no longer wonder that I actually am one, that I turned out to have the ability to write and publish books, a skill or a talent (I believe both) that very few people who want to be writers actually have. I am comfortable now in the knowledge that this ability is mine, and with hard work and discipline, and a little inspiration, I can exercise it whenever I want. Even when I got home I didn’t open the package. I made homemade lemonade instead. And then, when I could put it off no longer, I sat down on the sofa with the cardboard box on the coffee table in front of me and, taking a breath, keyed open the top. Ralph Keyes, in his book The Courage To Write, describes the ambivalence of the author when he holds for the first time his published novel. Has the publisher made a mistake? Will people like it? Will the reviewers? Does it reveal too much of himself? Not enough? Is it worthy, what the Greek call axio, and the root of the word axiomatic? All of these thoughts and feelings have been familiar to me, and the pure joy that most people assume a writer feels during the seminal moment of holding his book for the first time has been, in the past, married by these lesser, and sometimes greater, considerations. This was not my problem this time. I was worried about an emotional reaction. I’ve told a number of people, including my publisher, that the publication of Just Beneath My Skin marks less my return to the landscape of Canadian literature than it does a return to my authentic self, that part of me that was lost, and almost effaced, by the terrible self-inflicted sickness I experienced between 2006 and 2012 and that nearly claimed my life. At one point during that sickness, in a filthy, insect-ridden hotel room in San Francisco, I told a stranger “I don’t want to write anymore.” That was the first time I’d said those words in my life, and even I as they left my mouth I knew some bottom had been reached, some spiritual nadir I might never be able to climb out of again. I did write again, and want to, but it took a while. Just Beneath My Skin was written before 2006, but I knew, based on an experience with another book with a west coast publisher, that I was in no shape to edit it, and fortunately I let it sit until the late winter of 2010. Even then I did not get better enough to give it any attention, and only when I sobered up in 2012 did my publisher and I roll up our sleeves and get to work, and not without some misgivings on their part I might relapse and flush once again the whole venture down the toilet. I wrote my first novel in recovery then, which has not yet been sold but is in my agent’s hands, and I’ve moved onto something else. Just Beneath My Skin is a relic, written in a different time, a missive from another world. And so, when I finally opened the box and lifted the first copy off the stack of them inside, I had no idea what to expect. I was surprised at what I got. Warm, genuine happiness. No ambivalence. No misgivings. I hope that people like it, but Just Beneath My Skin, as is any book, was a gift to me by a greater good. Johnathon Franzen has stated that it took the tremendous success of The Corrections to convince himself he actually was a writer, and even then he wasn’t so sure. For me it hasn’t been the wild success, for that has eluded me, and perhaps always will. What has convinced me is that despite all that I have endured–much of it, again, self-inflicted–I have retained the need and the want to write. Push aside like unnecessary organs the pomp and the praise and the happenstance and you get at the surgical heart; I write for the same reasons I wrote when I was eight. Because I have to. Without writing, my life is just not complete. It is no longer all of my identity, and I am not as invested as much in what people think, but to not do it would would be a partial amputation of my spirit. It sounds hokey to say so, but artists are such a strange breed because there is very little separation between what they do and what they are. The only real problem results when you cannot separate what people think of your work, and what you think of yourself. And so it begins for me. More than ever, during this part of the process, it is important to be working on something else. I care about the reviews, of course, and the readership. I want the book to be liked. But I can’t be overly invested in what you think. These characters are written and done with, and I couldn’t change them if I wanted to. I don’t want to. I spent most of yesterday lying on my back like the frog reading The Lord of the Rings and marvelling how it hasn’t dated itself at all. It is as vital and compelling now as the day it was written. Today I go back to work, the copies still in the box. Other than my immediate family, I still haven’t figured out who to give them to.